By stefanos on Thursday, October 8th, 2015 in Area Guides. Amwell Street is located in Islington, London and is a street unlike any other. Its charm and charisma are clear for all to see and not just local residents but those who are passing through the lovely area. Islington has in recent years become a safe haven if you will for London’s writers as well as artists. Islington borough has some of the best theatres around as well as featuring amazing restaurants and a famous nightlife. Islington is home to Arsenal FC’s football ground among other neat places to visit. This guide will take you through Amwell Street showing you the best places to eat along the Street and other areas of interest around it. The area has radically transformed from a thriving and bustling industrial hub to being one of the most sought after office places for magazines as well as exclusive bars while also providing high end properties for the working young professionals who want to live in the area. The typical residents of Amwell Street tend to be middle class people – young professionals, craftspeople, artists as well as shopkeepers. The properties along this road are some of the most sought after places particularly because of their proximity to central London. For an individual working in London buying such a property can prove a worthwhile investment. Making the choice to invest in a property along Amwell Street whether the property is detached, semi-detached or terraced is one which should not be taken lightly and casually. Amwell Street is full of charming Victorian as well as Georgian terraces. It is a quiet street hidden from the prying eyes of the world as it were, that has become a favourite place to set up shop for many business owners. Residents of the little area pride themselves in being actively involved in helping to keep the little area safe from all unwanted developments that would otherwise take away from the mystical charm of the place. A day along Amwell Street or around the Amwell area need not be boring. With so many great and exciting places to visit and see it really is an adventure waiting to be explored. For the art and dance lovers visiting the internationally acclaimed Sadler’s Wells Theatre will prove a good place to start. While there you may be fortunate enough to catch the renowned fashion designer-now-turned-dancer Hussein Chalayan working on one of his many projects. The theatre is only a 3 minute walk from Amwell Street. For those more into art exhibitions then be sure to make your way to the Guildhall Art Gallery which is only a 6 minute walk from Amwell Street to enjoy the vast collections of art and other interesting posters on display. It’s a great place to hide from the rain as well! It makes for an enjoyable trip when the weather is being none too pleasant. 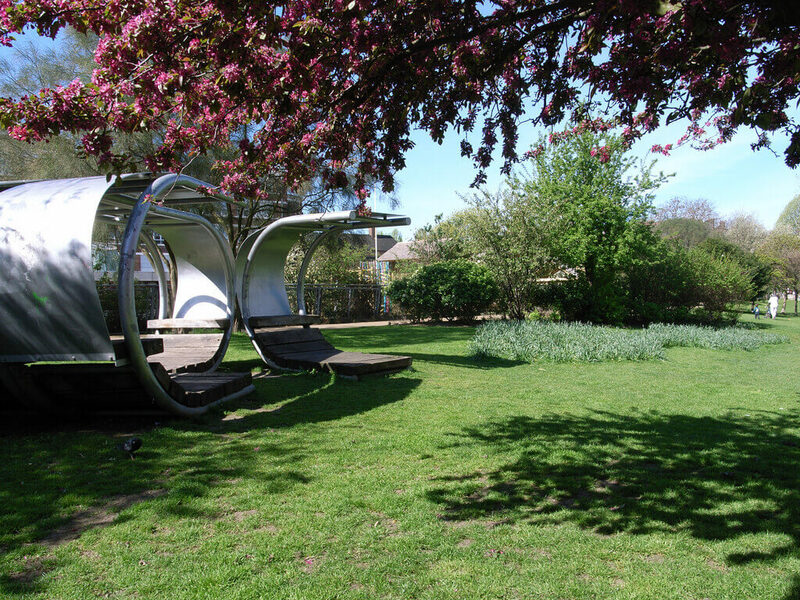 Spa Fields Park is a mere 5 minutes away from Amwell Street and can be a wonderful place to enjoy as you take a break from all the walking up and down Amwell Street. Why not sit down and catch your breath amidst the well maintained lavender gardens and shrub beds. It truly is a great place to just kick off the shoes and relax. The Park can get quite busy though as it sits next to the Three Corners Centre for youth and the Adventure Playground for tiny tots. Spa Fields stretches a modest 2.02 acres but still manages to pack in a children’s playground, tennis court, an area to play football in complete with goal posts and basketball area. Farringdon Tube Station is closer to this park than Angel Tube Station. Amwell Street can be easily accessed when you take the tube. The closest station to the Street is Angel Tube Station being only 6 minutes away. This tube station can be found towards the north east. The nearest underground stations to Amwell include Farringdon Tube Station which is 12 minutes away from Amwell Street. King’s Cross Tube Station is also 12 minutes away from Amwell Street and from here you can take the tube to Piccadilly, Victoria, Circle and Bakerloo. Life around Amwell Street is all fun and games with many restaurants, bars, pubs and entertainment areas not only located on Amwell Street itself but also in the area around the Street. There is so much to do and see on Amwell Street as all shops are relatively within walking distance for residents so you never have to venture far to find a good place to eat or to meet with your friends. If you want a quieter and more refined place to eat from and are thinking more along the lines of Spanish food then why not give Moro restaurant a try? Perhaps you are looking for something more Oriental in nature. If this is the case then the Old China Hand is probably the place you want to be at. This elegant Chinese restaurant serves only the finest foods around and do you want to know what the best part is? It is only 3 minutes from Amwell Street. We cannot round up the list without making mention of Quinto Quarto which although located on St John Street is also only 3 minutes from Amwell Street and is well known for serving mouth-watering Italian cuisine. La Porchetta too has made a good name for itself as an Italian restaurant. It is definitely a place worth considering when you want to grab a bite of some Italian food. The Lexington which is just 4 minutes from Amwell Street is a well-known place for hosting Dumb Disco Ideas which are fun and hip events held specifically from mid-august to the end of October. These events draw large numbers of people and are regarded as being a highlight of sorts by some. Club El Paso is a favoured club just 4 minutes from Amwell Street for those looking for a night of fun. Another key place to look out for near Amwell is Rhum Jungle and O’Hanlon’s. Life around Amwell Street doesn’t get any better than these two places. 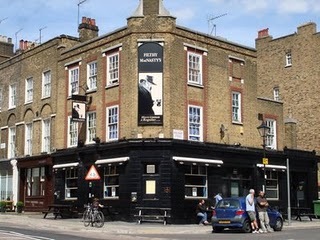 Filthy MacNasty situated at 68 Amwell Street is one of the best loved Irish pubs around. Its uplifting atmosphere will make downing a beer a joy, and if ever you are around during St Patrick’s Day, the pub will give you an experience you will never forget. If you are a poetry lover then make a date to visit when the pub is having one of its poetry readings. If you have time you can even stay and enjoy the live band that plays there frequently. Exmouth Market found 4 minutes from Amwell Street is a favoured market for those looking for more than just a nice place to eat at. There are a number of hang out places where you can enjoy a couple of games such as the Cafe Kick where you can literally enjoy a good kick – on the table football of course. The Ambassador located at 55 Exmouth Market is 4 minutes away from Amwell Street. It combines great food with an ice cold beer and is well known for being a gastro pub par excellence. The area around Amwell Street is home to a host of fine educational establishments with the first one of note being the Islington Connexions Careers Centre which is located only 5 minutes from Amwell Street on White Lion Street. Connexions stands out in particular because it is an education advisory centre that gives education related advice to 13-19year olds as well as being an information centre for under 25s who face learning challenges. Whether a student is struggling with accommodation, money issues, or drugs, this centre is dedicated to bringing solutions for those who need them most. The easiest way to get to this centre is to use the Angel Tube Station which is only 4 minutes away. The London College of English is another fine example of English education that is 6 minutes from Amwell Street. Primary schools in the area include Hugh Myddelton Primary School, Clerkenwell Parochial School as well as Moreland Primary School. For secondary education parents can send their children to Elizabeth Garrett, Central Foundation Boys or Islington Green. The enclave that is Amwell Street has all the basic amenities that you could think of. From cafés, to delicatessens to launderettes, you will find all and more on Amwell Street. The closest fitness centres around Amwell Street include the Yoga Therapy Centre and the Locomotion Fitness & Leisure Club. The closest one to Amwell Street is the Yoga Centre which is a 4 minute walk away while the Locomotion Fitness & Leisure Club is 5 minutes away. We all know how troublesome not having a washing machine can be. Well, while you wait to get your current one fixed, changed or replaced, you can still get all your weekly and daily laundry done thanks to the Amwell Launderette. While you are on Amwell Street you might as well drop off your suits and other clothes that need dry cleaning services at Amwell Dry Cleaners. Whether you are a newly wed couple or family moving into the area and are keen to start your homemaking on the right foot, don’t hesitate to go to the Curtain Workshop and Home to Be to see what they have to offer. They are very efficient and will probably have everything pertaining to home equipment that you will need to transform your house into a home. If you are looking for a property in City & Clerkenwell do not hesitate to call our local offices.